The Department of Internal Medicine is continually searching for the best and the brightest faculty to join our team. Whether you are a clinician working at the bedside or a researcher at the bench, the University of Michigan is at the leading edge of health care. We provide unique career opportunities at our U-M Medical Center (the main complex for patient care at Michigan Medicine) or at many specialty care centers and outpatient clinic locations. No matter where you work at Michigan Medicine, you are part of a diverse team of renowned clinicians and researchers whose work spans the globe. For more information about joining the University of Michigan faculty, visit the U-M Medical School's Office of Faculty Affairs and Development or look through our current opportunities below. improving the health and well-being of those underrepresented and underserved in health care through continuous quality improvement initiatives, health equity research, inclusion science, implementation science, outcomes research, and community-based participatory research. transforming health care by creating a climate and culture that promotes inclusion, cultural sensitivity, diversity, and health equity. recruiting and retaining a diverse community of leaders, faculty, staff, learners, and trainees. Michigan Medicine is seeking applicants for a clinical faculty position in the Division of Allergy and Clinical Immunology. Applicants should be either board eligible or board certified in Allergy/Immunology, hold (or have the ability to obtain) appropriate medical licenses for the State of Michigan, and evidence of clinical teaching proficiency. Responsibilities will consist of serving as a staff physician in the Allergy and Clinical Immunology Clinic and participate as an attending physician on the Allergy and Immunology inpatient consult service at the University of Michigan Hospitals in rotation with other faculty. In addition to clinical activity, the ideal candidate will be excited to participate in teaching of medical students, house officers and fellows, and scholarly activity. The Division has a fully-accredited and strong fellowship program with four fellows. The position is available to both internal medicine- and pediatric-trained applicants. The rank of the selected candidate will depend on qualifications, and is available at the Instructor/Assistant Professor/Associate Professor/Professor level. The University of Michigan is an equal opportunity/affirmative action employer and encourages nominations and applications from women and minority candidates. The Division of Allergy and Clinical Immunology, Department of Internal Medicine at the University of Michigan, has an exceptional opportunity for a faculty appointment in the tenure track for individuals involved with basic, translational, and/or clinical research endeavors. A generous start-up package with significant protected time for research will be provided, with the eventual goal of independent federally-funded research. The rank of the selected candidate will depend on qualifications, and is available at the Assistant Professor, Associate Professor, Professor level. In addition to scholarly activity, the ideal candidate will be excited to participate in patient care duties, along with teaching of medical students, house officers, and fellows. The position is available to both internal medicine and pediatric-trained applicants. The Division of Cardiovascular Medicine at the University of Michigan is seeking a candidate for a faculty position in cardiology and echocardiography. Applicants must be board certified or eligible in cardiology and echocardiography, and have Level 3 training in echocardiography. Candidates should have experience in advanced echocardiographic techniques, including transesophageal and stress echocardiography, echocardiography during interventional procedures, 3D echocardiography, and strain imaging. In addition, a proven track record and interest in echocardiography research is also desired. Responsibilities will include attending in the echocardiography laboratories of University of Michigan and the affiliated VA hospital, as well as attending on the cardiology inpatient or consult services. Additional responsibilities will include providing outpatient clinical cardiology care, supporting the interventional cardiology programs such as the TAVR program, and teaching of fellows, residents, and medical students. This is an excellent opportunity for a candidate seeking to develop an academic career in cardiology and echocardiography. The echocardiography laboratory of the University of Michigan is a nationally recognized, high quality, high volume laboratory with state of the art equipment and facilities. The university’s location in Ann Arbor, Michigan is consistently rated among the top places to live in the United States. The University of Michigan is an Equal Opportunity Employer. This position is not eligible for visa waiver or sponsorship. Qualified applicants are invited to submit a current CV with bibliography and a cover letter to: Theodore J. Kolias, MD, Director, Adult Echocardiography Laboratory, University of Michigan Health System, 1500 E. Medical Center Dr., CVC Room 2143, SPC 5853, Ann Arbor, MI 48109-5853. E-mail: tkolias@umich.edu. Michigan Medicine, Division of Gastroenterology and Hepatology, seeks applicants for faculty positions specializing in gastroenterology to join our expanding practice. The new clinical facilities will include clinic, endoscopy, and gastroenterology physiology services to support continued growth for the future. Candidates must be board certified in Internal Medicine and BC/BE in Gastroenterology (eventual board certification required) and are expected to have a commitment to patient care and endoscopic practice with an interest in teaching and academic medicine. Rank and salary are commensurate with experience. The University of Michigan, Division of General Medicine, seeks BC/BE internists to join our expanding Academic Primary Care faculty. Duties for Primary Care faculty include providing direct patient care in an outpatient setting with teaching opportunities. There are also opportunities to engage in population management and quality/safety activities. Prior training or clinical experience in an academic teaching environment is preferred. Application review will continue until the positions are filled. The Division of Hematology and Oncology, Department of Internal Medicine, and the University of Michigan Comprehensive Cancer Center seek applicants for faculty positions specializing in malignant and/or general hematology. Applicants (who must be either U.S. citizens or resident aliens) must be board certified or eligible in hematology +/- medical oncology with interest and expertise in the evaluation and management of patients with hematologic disorders. The successful candidates will have the opportunity to participate in patient care in a multidisciplinary environment, fellow and staff training, and clinical research. Academic rank and salary will be based on prior experience. Selected candidates have the opportunity to be a member of the established Hematology/BMT Program in the University of Michigan Comprehensive Cancer Center, a clinical and translational research program with over 30 faculty. Interested individuals should forward a curriculum vitae and letter describing clinical and scholarly interests to Pavan Reddy, MD, Chief, Division of Hematology and Oncology, University of Michigan, 7215 Cancer Center, 1500 E. Medical Center Drive, Ann Arbor, MI 48109; e-mail: cvuocolo@umich.edu. The University of Michigan, established in 1817, is a world-class research university with an exceptional health system. The Division of Hematology and Oncology, Department of Internal Medicine, and the U-M Comprehensive Cancer Center (UMCCC) seek applicants to join the GI Oncology Program. The selected candidate will have the opportunity to join a large clinical practice in GI oncology, with multidisciplinary tumor clinics in pancreatic, liver, and colorectal neoplasms. The GI Oncology Program is also supported by a GI SPORE. Successful candidates will have a strong background in clinical research, particularly therapeutic clinical trial design and execution, with a track record of peer-reviewed publications and extramural funding. Excellent clinical skills appropriate for a tertiary level subspecialty GI oncology practice are required, as well as effective communication and leadership skills, and a commitment to service excellence. A generous start up package and protected time will be provided to pursue research interests and develop the clinical research portfolio of the program. Applicants (who must be either U.S. citizens or resident aliens) must be board certified or eligible in medical oncology. Academic rank and salary will be based on prior experience. Interested individuals should forward a curriculum vitae and letter describing clinical and scholarly interests to Pavan Reddy, MD, Interim Chief, Division of Hematology/Oncology or David C. Smith, MD, Associate Chief, Division of Hematology/Oncology, 1500 E. Medical Center Drive, Ann Arbor, MI 48109-5942; e-mail: cvuocolo@umich.edu. Michigan Medicine, Department of Internal Medicine, is seeking a board-certified candidate for a leadership role in the Division of Hospital Medicine as Associate Division Chief for Clinical Affairs. The Associate Division Chief will participate in the administrative and clinical operational activities of Hospital Medicine at Michigan Medicine and the VA Ann Arbor Healthcare System (VAAAHS). The Associate Division Chief will work closely with and report directly to the Division Chief of Hospital Medicine. This position includes dedicated and protected time for leadership and management duties within the Division of Hospital Medicine at Michigan Medicine. The Associate Division Chief for Clinical Affairs fills a key operational and strategic role within the Division of Hospital Medicine. The candidate will oversee all service line directors and corresponding senior Divisional leadership (e.g., Clinical Service Chief, Director of Clinical Strategy). The candidate will help oversee recruitment and retention of clinical faculty, service line directors and day-to-day operations such as clinical scheduling and clinical faculty evaluations. In addition, a focus on academic growth of clinical faculty through direct mentorship, coaching, and sponsorship are expected. The Associate Division Chief will be expected to work closely with the Division Chief to continue to identify opportunities to improve patient flow, fiscal performance, and provider engagement to improve and expand the footprint of Hospital Medicine at Michigan Medicine. Participation in direct clinical care and teaching activities across the Division of Hospital Medicine is expected. These duties include teaching of residents and medical students on traditional general medicine wards, direct patient care on non-resident/direct-care services including those dedicated to unique patient populations (e.g., hematology/oncology, renal/transplant), and the medical short stay unit. An optimal blend of these duties will be determined based on the candidate’s interests and divisional needs. Prior training and clinical leadership experience at a major academic medical center is required. Candidates must be at the rank of Associate Professor or higher. Excellent benefits and compensation package with guaranteed salary plus incentive bonuses. Relocation support will be provided. Oversee divisional leadership including service line directors, medical directors, service chief, and clinical strategy lead. Participate in directing and evaluating operational and corporate functions of recruitment, retention, reimbursement and billing, information technology services, and infrastructure support as they relate to Hospital Medicine. Assist in developing and implementing Hospital Medicine standards focused on ensuring timely and efficient clinical care with appropriate allocation of resources. Translate strategy into actionable improvements to enhance operating margin, patient and staff satisfaction, access, and utilization. Guide and implement performance improvement in clinical quality measures and assurance of patient safety. Maintain existing and develop novel strategies to improve core functions of hospital medicine including admission, discharge and transitions of care between inpatient, outpatient and home care. Provide leadership for Hospital Medicine faculty through direct academic mentorship, coaching, and sponsorship of activities. Provide leadership for development, implementation, and evaluation of innovative clinical and academic programs and processes. Participate in the recruitment, mentoring, and performance review of Hospital Medicine faculty and directors. Lead divisional meetings and forums such as hospital medicine town-halls and divisional grand rounds. Maintain effective and collaborative relationships with the Department of Internal Medicine, Quality Management Program and Population Health, the Medical Staff, Nursing Administration, Hospital Leadership, and other constituencies of Michigan Medicine. Continue to ensure the growth and vitality of members of the Division of Hospital Medicine. Note: This position is posted as a Clinical Assistant Professor/Clinical Associate Professor/Clinical Professor. Rank of selected candidate is dependent upon qualifications. M.D. or equivalent degree with a sustained record of clinical and academic accomplishment and at least 10 years of experience as a physician leader in a reputable academic health system. Ideal candidate must have evidence of scholarship (peer-reviewed papers), mentorship, and consistent achievement in clinical, teaching, quality and/or research domains as evidenced by local, regional, national awards, and honors. Eligible for a faculty appointment in the University of Michigan Medical School at the rank of Assistant Professor or higher. Should hold or have the ability to obtain the appropriate medical license in the State of Michigan as well as be board certified or board eligible. Considerable progressively responsible experience in health care delivery and a track record of effecting change in hospital medicine. Progressively responsible administrative experience in strategic planning that has led to innovative, high functioning, and growing clinical care in hospital medicine. Considerable prior direct oversight and management of hospitalist clinicians (physicians, advance practice providers and allied fields) within an academic medical center. Experience and knowledge in implementation to enhance outcomes related to care coordination, lean and quality improvement, and information technology utilization. Sophistication and prior experience demonstrating a commitment to creating a culture that enhances employee and patient satisfaction. Strong knowledge of current regional, state, and federal policies governing health care delivery and planning. Considerable knowledge of modern management practices and methods. Michigan Medicine improves the health of patients, populations, and communities through excellence in education, patient care, community service, research and technology development, and through leadership activities in Michigan, nationally and internationally. Our mission is guided by our Strategic Principles and has three critical components; patient care, education, and research that together enhance our contribution to society. 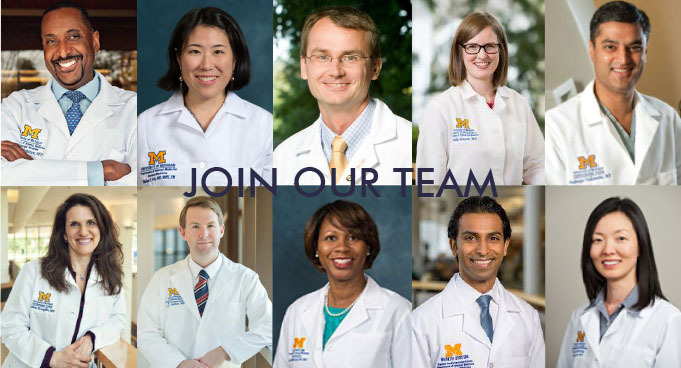 The University of Michigan, Division of Hospital Medicine seeks BC/BE internists to join our growing and dynamic Division starting in July of 2019. Hospitalist duties include teaching of medical residents and students, direct patient care in our non-resident and short stay units, and involvement in quality improvement and patient safety initiatives. Novel clinical platforms that feature specialty concentrations (hematology/oncology service, renal transplant service, and bone marrow transplant teams) as well as full-time nocturnist positions are also available. Our medical short stay unit provides care for both observation and inpatient status patients and incorporates advanced practice providers as part of the medical team. The ideal candidate will have trained at, or have clinical experience at a major US academic medical center. Sponsorship of H1B and green cards is considered on a case-by-case basis for outstanding individuals. Research opportunities and hospitalist investigator positions are also available for qualified candidates. This is not a J1 opportunity. Excellent benefits and compensation package with guaranteed salary plus incentive bonuses. Relocation support is provided. The Division of Metabolism, Endocrinology & Diabetes (MEND) and Podiatry is recruiting both endocrinologists and podiatrists within the expanding University of Michigan. Candidates must be board certified in the appropriate subspecialty (Endocrinology or Podiatry). Candidates are expected to have a commitment to patient care with an interest in teaching and academic medicine. Rank and salary are commensurate with experience. The University of Michigan, Division of Nephrology in the Department of Internal Medicine invites applications for open faculty positions at the rank of Assistant, Associate, or Full Professor, to develop and conduct independently funded basic, translational or clinical research programs. We are searching broadly for researchers with M.D., M.D./Ph.D., PhD or equivalent degrees and demonstrated academic excellence appropriate for career stage. Academic Rank will be commensurate with experience. Successful applicants will be expected to develop or continue a robust extramurally-funded research program that compliments current strengths within the Division. Any area of nephrology will be considered, however, we particularly encourage applicants with expertise in the areas of systems biology, multi-scalar data integration, metabolomics, genetics, glomerular diseases, kidney development, diabetes, epidemiology, and health services research. The Nephrology Division has a broad-based research portfolio with ~ $15 million research budget annually including the George M. O'Brien Michigan Kidney Translational Core Center and the Coordinating Center for the United States Renal Database System (USRDS). Successful candidates will receive a competitive salary and start-up package. To apply, please submit a concise statement of current and future research plans, a brief description of clinical experience, a curriculum vitae, and contact information to: Dr. Subramaniam Pennathur, Chief, Internal Medicine/Nephrology, 5309 Brehm, 1000 Wall Street Ann Arbor MI 48105 or to spennath@med.umich.edu. Review of applications will begin 12-01-2016 and continue until suitable candidates are identified for the positions. Women and minorities are encouraged to apply. The University of Michigan is an equal opportunity/affirmative action employer and is supportive of the needs of dual career couples. The University of Michigan’s Department of Internal Medicine Division of Rheumatology provides over 22,000 patient visits per year in 7 different locations in and surrounding scenic and culturally diverse Ann Arbor. With over 35 clinical and basic science faculty members, a robust clinical fellowship program and 9 fellows, we endeavor to provide the best rheumatological care available anywhere. Our purpose is to improve lives through curing, treating, and preventing rheumatologic disease. The Division of Rheumatology has extensive programs for clinical care, clinical research, translational research, and basic science research in lupus, scleroderma, rheumatoid arthritis, vasculitis, myositis, as well as other rheumatologic diseases. Our guiding principles are teamwork, caring, integrity, and innovation. As a USNWR top 15 program we are seeking candidates for clinical faculty positions in the clinical instructor through clinical professor ranks. Patient care, clinical research and clinical and didactic instruction for medical students and house officers. MD or equivalent, ability to obtain MI Medical License, ABIM certification. Academic clinical and research experience in rheumatology. Evidence of clinical competence and competence in clinical and didactic teaching is expected. This position is posted as Clinical Instructor/Clinical Assistant Professor/Clinical Associate Professor/Clinical Professor. The rank of the selected candidate will depend on qualifications. The ideal candidate will possess the right combination of clinical expertise, leadership experience, and personal communication style to strengthen the capability of our workforce while striving to enhance the patient and faculty/staff experience to the highest levels. Innovation is a major focus of our team as we prepare for care delivery models that will be required in the future.